"Can you hear Atlantia breathing?" This cover is gorgeous! We love Ally Condie and her Matched series, and we can't wait to see where she takes us next! That cover is beautiful, but I'm still kind of on the fence about this one. I liked Matched, but I never finished the rest of the series . 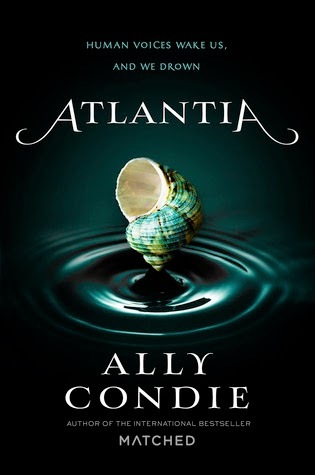 . . but I really am a sucker for a pretty cover, and I LOVE anything to do with Atlanti(s)a, so I don't know who I'm trying to kid ;) Great pick! I loved the Matched books, and I am looking forward to another book from Condi. Great pick. You know I have some issues with Matched but this does sound good and I don't read many books with the whole underwater them so that would be a fun aspect. Love the cover. Great pick. I need to share this with my oldest..she loved the Match series! The cover is simple, yet beautiful. I haven't read any of her books, but people seem to really like this. This certainly sounds interesting.